Sure, six-pack abs and bulging biceps are nice exercise rewards, but more important, staying fit significantly improves a man's overall health. Here's how. Most guys know they need to exercise to burn calories and keep weight off to look their best. However, the benefits are more than skin-deep: Being physically fit helps men live longer, lowers their risk of certain diseases, improves their quality of life and can even help maintain testosterone level as they age. Higher testosterone levels Research suggests that exercise may help counter the drop in testosterone that occurs as men age. In one study, even a modest boost in physical activity increased testosterone levels. This was true as well for men who hadn't been exercising before. In contrast, the safety of taking testosterone supplements to raise their "T levels" is still in question. Better quality of life Regular physical activity can improve overall quality of life by helping relieve tension, depression, anxiety and anger. Most people report improvements in general well-being when they include physical activity in their routines. Research shows that as little as 30 minutes of moderate exercise a day can boost energy levels, the ability to sleep soundly and self-image in both men and women. 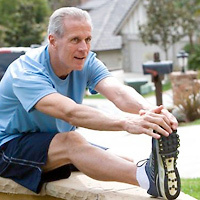 Lowers risk of some cancers Men who are physically fit in middle age have lower cancer risks as they age. Research from the American Society of Clinical Oncology found that men who were the most physically fit in middle age were less likely to have lung or colorectal cancer as they got older. Other research has also shown that physical activity helps lower the risk of certain cancers. Lowers risk of cardiovascular disease The bad news is that men are more likely to have a heart attack than women are, and men's death rates from heart disease are also greater than women's. The good news is that regular exercise improves blood circulation, which reduces the risk of heart disease and stroke. Moderate exercise also improves many risk factors for heart disease, including lower blood-cholesterol levels, lower blood pressure and improved blood-sugar levels. Lowers risk of death from diabetes and sleep apnea Obstructive sleep apnea is a disorder in which you frequently stop breathing during your sleep, and it's associated with an increased risk of diabetes. For men with sleep apnea and diabetes, moderate exercise decreases the risk of death from both conditions. Longer life Need one more reason to stay fit? How about a longer life? For men, fitness level can predict length of life even better than body mass index (BMI) can, according to a study of more than 14,000 men. As a man's fitness improved, his risk of death from all causes dropped 15 percent and his risk of death from heart disease was reduced by 19 percent. Changes in BMI didn't show the same benefits.